As we all know, puns and metaphors are the basis for any self-respecting online slot and of course some are better then authors. 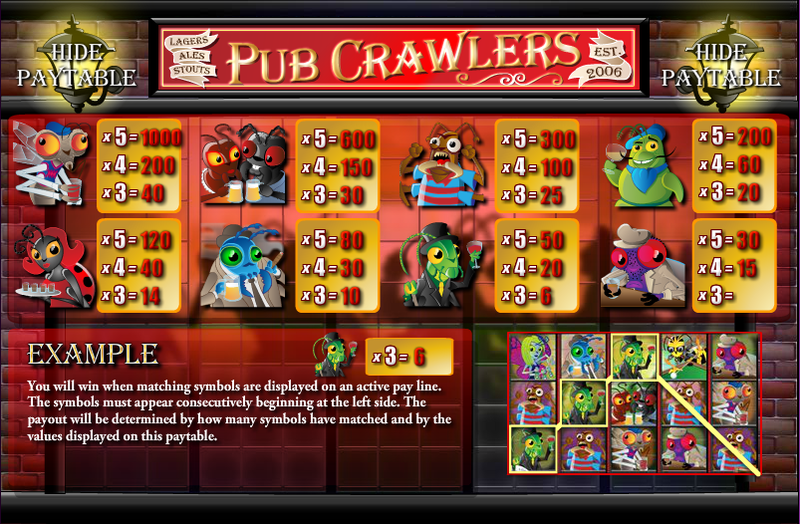 Pub Crawlers from Rival Gaming is a good example; we all know what a pub crawl is but the crawlers here are a variety of insects who just happen to be the patrons of this particular hostelry. 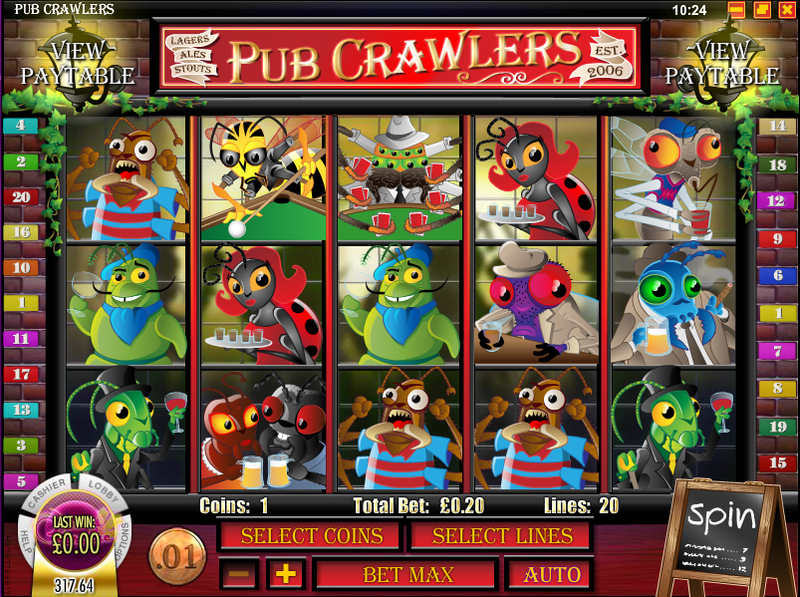 Pub Crawlers is a five reel slot with up to twenty paylines and it’s theme is of course the gold old British boozer. This one looks reminiscent of a an East End-style pub with lead lined windows, tucked away down a narrow side street. Those windows are the backdrop to the reels and all the symbols are insect characters enjoying the atmosphere. These include a fly, a grasshopper, a ladybird, etc. The wild is a butterfly barmaid and there are two scatters – a wasp and a scorpion bouncer – who activate their own features. A cockroach is the ‘drop’ icon. This is Rival Gaming’s version of cascading symbols and it’s triggered by landing three or more of the cockroach icons on an active payline. Those symbols will now disappear, letting more fall into their place and possibly providing another win. All wins during this feature are subject to a 3x multiplier and it’s possible to earn more spins by landing three+ more scatters. You will need to land three or more of those pool-playing wasps anywhere on the reels to trigger this feature. It’s a game of darts and you are in control. It’s easy enough to follow the instructions but what you have to do is place the dart in the starting position on the mat and then click the power meter to throw it. You will earn coins for each throw which hits the board. It doesn’t really seem to matter where you place the dart or how hard you throw it – the dart always seems to land on the board and win some money so don’t spend too long trying to work out the optimal placing and strength. As keen pub goers we naturally gravitate towards themes such as this and the game itself doesn’t disappoint either; some nice graphics are coupled with several bonus features which are regularly triggered. The sounds are not particularly pub-like though and the RTP is a low 90.41%.